Yes, many of the famous startups emerge from Silicon Valley. But increasingly, as communications infrastructure improves, startup hubs are popping up all over the world. What does this mean? More startups! And for me, it meant the chance to intern out of an emerging tropical startup hub in Asia. An experience that would have been unthinkable just five years ago. I didn’t know much about entrepreneurship initially, but after turning my hand to marketing, logistics and research, I left knowing a lot more. Landing pages, email marketing, social media and strategic partnerships: the more you know, the more useful and marketable you are. My internship helped me launch my career as a freelancer and opened my eyes to what was possible. In fact, when it comes to traveling, running businesses and living abroad, I learned the possibilities are endless. I feel like I learned more during that half a year in Asia than I learned in three years of college. In the old days, people worked for decades to establish themselves in their chosen fields. The people at the top of an organization should theoretically know more than those in more junior positions. Now new ideas and practices spread so quickly that you’re able to position yourself as an expert on something just by staying on top of the latest trends. For the first time in history, young people have a real advantage in business. They don’t need to spend decades ‘working their way up’, they can make themselves indispensable right from the start – as long as they keep learning. It sounds nuts doesn’t it? But when I was at Hubud in Bali, I saw it again and again. 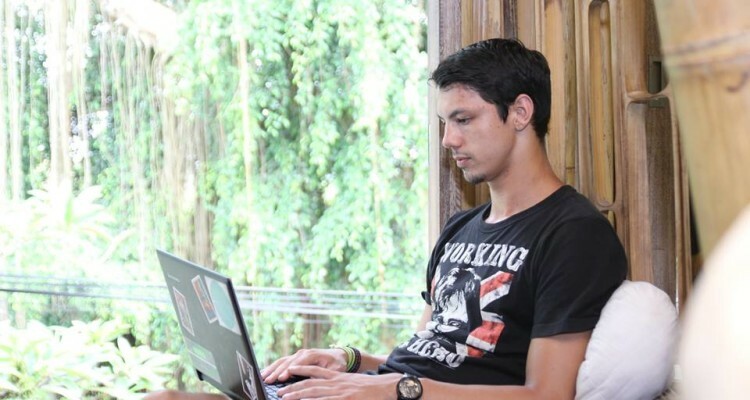 People from all over the world are coming to Bali (and similar hubs) to work on their businesses. Some stayed for months – or even years. While others, stayed for just a few weeks. As long as they had access to an internet connection and freelance talent, they were able to build, launch or grow. I never previously considered myself a good fit with entrepreneurship. I associated entrepreneurship with suits and sales patter. When I worked in Bali, I didn’t encounter a single suit – apart from the occasional wetsuit – after a morning surf. Returning to university after that experience, I see all the same flyers, emails and talks about graduate jobs and postgraduate study opportunities as before. But this time, it’s different because I now know that the corporate life is not the only option. The great thing about startups is the ocean of possibility. Anything is possible. And much of it is up to you. A lot of startup life is about discovery. What do people want or need? How can we offer something different that solves a unique problem? Most young people say they want to work in a ‘dynamic’ environment – well in my experience, it doesn’t get much more dynamic. I think I knew it all along, but now I know for certain – I will never work in a conventional office. Coworking spaces are fun and inspiring places to work. And the coworking movement is going from strength to strength which means more amazing spaces to work. From beaches on tropical islands to mountains and jungles, where there’s WiFi, there’s a potential workspace. Do you want to learn in-demand skills abroad?